6 days ago I dropped a heavy jar on top of my foot. Shortly after my foot began to swell and the bruise covered most of the top of my foot. I could walk on it no problem, but there is one spot on top of my foot that is red and extremely painful to touch. It feels like there is a small hard bump there. I cannot even get a shoe on that foot after 6 days. Xray taken yesterday and Dr. said it was not broken, but that spot on top of my foot is so painful to touch I can't even put a blanket over it at night. It has a bad burning feeling where the lump is. Should I just grin and bear it? 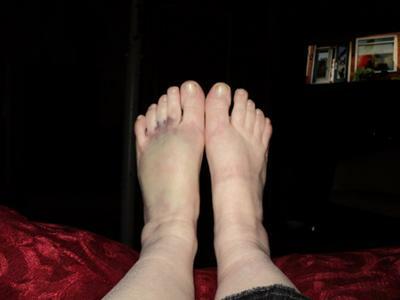 That certainly is a badly bruised foot which means to me you must have "broken" one of the superficial veins that runs along the top of the foot and thus all the bruising that you are exhibiting. Since there is no broken bones, the two most likely cause of all the pain are the following. doctor to actually examine the area and confirm this, as I cannot make that diagnosis by looking at a picture. 2. The second possibility would be that of damage to the extensor tendons which are the tendons that allow you to bend your toes upward. They are usually very prominent at the level between the toes and the metatarsal bones and trauma to them at this level could certainly cause a lot of pain. This too is usually self limiting but can take longer because every time you are walking you force the tendons to go through their range of motion which in most people delays the healing, because you are not allowing the tendons to rest. Treatment for this might include immobilization to rest the tendons, some anti-inflammatory medication if you can tolerate such medication and even physical therapy to speed along the healing process. Those are the two most common causes of pain in that part of the foot that I can think of. Of course there are always more esoteric things that may be causing your pain. If six days have passed and you are still in a lot of pain, I would suggest you go back to the doctor and let he or she know about your problem and then have some appropriate medical care. Obviously, I know nothing about you, but the pain you state you are experiencing is out of proportion to the type of injury you sustained. Comments for Bruisng, swelling and painful to touch after I dropped a heavy jar on top of my foot. This happened to me 12 days ago and my foot is no longer bruised, but where the bench fell, it is red with a visible bump on it. All to the left and top of the bump it is "asleep". I feel pressure but I have no feeling in it to touch. If I'm not touching it it doesn't hurt, but if u touch it just right, or my kids step on it, it feels like a scorching knife going through it! But to walk, I feel fine.